Think your job is well, crappy, sometimes? Meet Steve Relles of Delmar. His job is literally crappy, and yet ... he loves it. Relles was working as a computer programmer for GE Plastics in 2002 when the company outsourced its computer work to India. Faced with no job and outdated web skills, Relles decided to go into business for himself -- as a doggy butler. In Relles' words, he's a "professional poop-scooper." Seriously. People pay him to clean up their yards and rid them of dog waste. He says he was inspired by a friend in Buffalo who was working as a so-called dog butler. 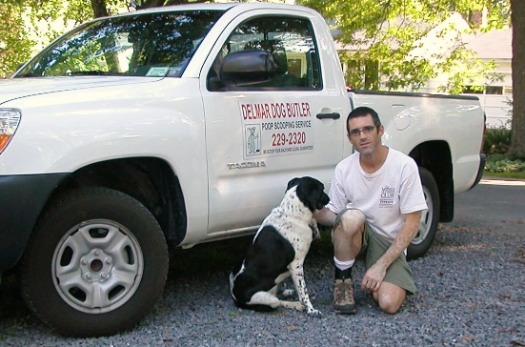 Nowadays, under the name "Delmar Dog Butler," Relles is his own boss. He has dozens of clients who pay him to scoop their yards on a regular basis. He also does one-time cleanups, where he'll just check out the yard and give an estimate. He says that right after the snow melts can be especially daunting. "What led me to become a dog butler wasn't my BS in math or 20 years of computer experience, that's for sure," Relles admits. Still, the father of two says he loves being in business for himself because it allows him to be home with his kids when they get home from school. He also gets to be outside and set his own hours. How much does a doggy butler make? Well, Relles says he typically charges $12 per week for one dog and $18 each week for two-dog yards. Still, being a doggy butler isn't all glamorous. Relles says his occupation embarrasses his 11-year-old daughter a little bit, and he spends a lot on gas money. But as the clichÃ© goes, it's a dirty job... but someone's gotta do it. Clinical lab tests suggest that having someone else pick up your dogs poo increases happiness levels by 100%.